However, he was having problems querying the user information necessary to correlate the user in Germany to the data he was collecting from the Boomerang script. He needed a way to collect both performance data as well as information about the user. If you want to take a look at the code I wrote for it, you can check it out in my Github repository: https://github.com/atorman/userInfo. The upcoming Summer '14 release notes came out late last week. There were over 330 pages of new features and goodness. However, my favorite feature being announced by far is Custom Permissions (page 172 if you're interested). What makes this feature one of the coolest ones I've worked on so far is that it enables customers and partners to define their own permissions while enabling administrators to still assign them the same way they assign any other permission on a profile or permission set. Often times, a salesforce developer will want to create an access check in their code that enables them to differentiate which users can access specific pieces of custom functionality. For instance, only administrators should be allowed access to the Permissioner tab and Visualforce page or only sales managers should be allowed to print the sales commission report. 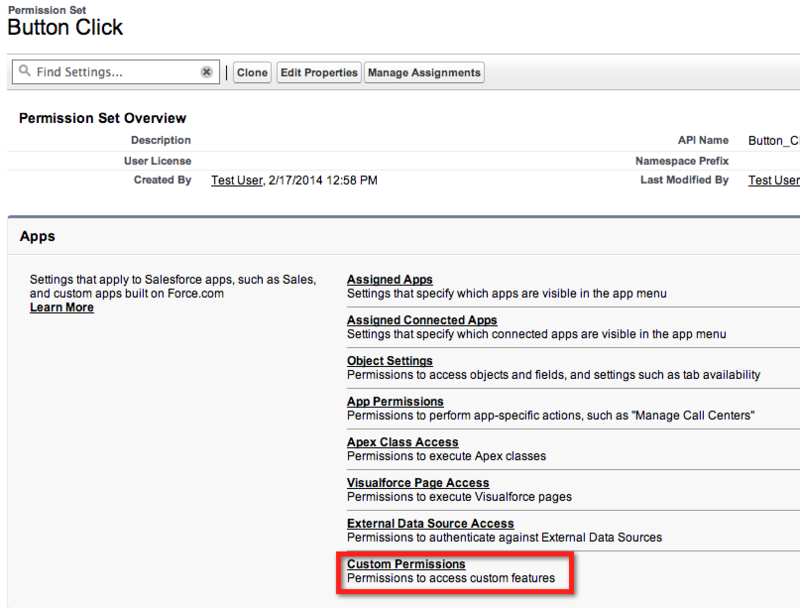 There are a variety of ways to create access checks on the salesforce platform. You can re-use an existing access control such as a tab setting or Visualforce page access. However, for everything else, a salesforce developer would have to create something completely custom. In the past, this has meant creating custom settings which are hierarchical in nature and administered separately from the rest of a user’s permissions. As a result, custom settings do not follow any of the normal behaviors associated with profile or permission set permissions like the ability for an administrator to easily assign them. Custom permissions enable developers to define new access checks that can be assigned to users the same way as any other user permission: through the user’s permission set or profile. This enables developers to focus on their code, while enabling administrators to manage custom permissions the same way as they manage standard user, object, field, and other kinds of permissions for users. That way the administrator can use point-and-click whereas the developer can use code. through SOQL using the SetupEntityAccess and CustomPermissions sObjects to answer whether any user has access to a specific or arbitrary custom permission. through the standard Connected Apps flow and the identity service to answer what specific custom permissions the current user has when they authenticate into their connected app. In setup, create a custom permission under Build | Develop | Custom Permissions. I've heard this use case frequently from customers. Rather than receive an insufficient privileges message after clicking on a button, you can choose whether to display the button based on the user's assigned custom permissions, thereby preventing users from getting an insufficient privilege message after the event. This usage pattern is more powerful than straight SOQL because it can string the multiple queries together into something that answers whether the user has access to specific custom permissions. This sample app was written by John Brock and can be downloaded from his Github repo: https://github.com/john-brock/Custom-Permissions to jump start your custom permission experience. This feature will be in Developer Preview in Summer '14 which means it will automatically be enabled for all Developer Edition organizations for people to play with and provide feedback for what they want to see.